DURHAM, N.H. - Maxim Gaudreault (Annapolis, Md.) scored with 1:57 remaining in regulation to lift the University of New Hampshire men's ice hockey team to Friday night's 3-3 tie against ninth-ranked Boston University at the Whittemore Center. - BU's Danny O'Regan completed his hat trick at 17:28 of the third period to give the Terriers a 3-2 lead. Jakob Forsbacka Karlsson set up the tally with a pass across the top of the crease to O'Regan at the right doorstep. Jordan Greenway was credited with the secondary assist. - Maxim Gaudreault (Annapolis, Md.) pulled New Hampshire into a 3-3 tie just 35 seconds later. The initial shot from the right point by Cameron Marks (North Vancouver, British Columbia) ricocheted off Marcus Vela (Burnaby, British Columbia) in front of the net toward the left post, where Gaudreault jammed the puck into the cage. - UNH goaltender Danny Tirone (Trumbull, Conn.) recorded double-digit saves in both the first (12) and third (14) periods, as well as four in the five-minute overtime session. - BU netminder Connor LaCouvee stopped the only shot he faced in OT as part of his 19-save effort. - Both teams scored a pair of second-period goals as BU took a 2-0 lead but UNH responded two consecutive goals. - O'Regan struck first just 12 seconds after play resumed in the middle stanza on a one-timer from the slot. Greenway, with the pass off the left half-boards, and Forsbacka Karlsson set up the tally. - O'Regan extended the advantage to 2-0 with a power-play goal at 6:41. Charlie McAvoy double-backed from the right point to the right corner before snapping a pass across the slot to O'Regan, whose shot hit Tirone but continued into the net. Matt Grzelcyk, with the pass from point-to-point, earned the secondary assist. - New Hampshire responded with a goal just 40 seconds later to quickly trim the deficit to 2-1. Jamie Hill (Glassboro, N.J.) collected a pass from Shane Eiserman (Newburyport, Mass.) on the right wing and cut to the slot, where he flipped a shot through LaCouvee's five hole. Harry Quast (Mullica Hills, N.J.) also earned an assist. - The Wildcats leveled the score, 2-2, with a power-play goal at 9:50 when Andrew Poturalski (Williamsville, N.Y.) snapped a centering pass from the right circle that Michael McNicholas (Manhattan Beach, Calif.) redirected into the net. Matias Cleland (Longmont, Colo.) picked up the secondary assist. - BU recorded a 12-3 shot advantage in the scoreless first period with both goaltenders making an acrobatic save in the last five minutes of the stanza. - With UNH on the penalty kill, Poturalski blocked a shot in the high slot and chipped the puck into the neutral zone to create a breakaway. He advanced down the slot but his shot from the low slot was kicked away by LaCouvee. - BU was cycling the puck in the offensive zone in the last minute. The puck was moved from the slot to the left doorstep, where O'Regan lifted a shot back across the goal mouth. Tirone, who was sliding head first across the crease, lifted his glove to make the save. 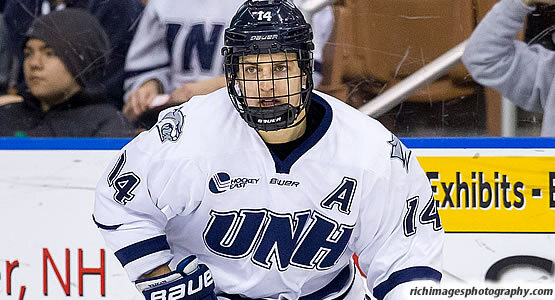 - UNH is 2-1-1 in its last four games against nationally-ranked teams (all since Jan. 30). - Poturalski extended his point streak to eight games; he has 4-6-10 in that span. - UNH had a balanced attack with nine players recording one point apiece.